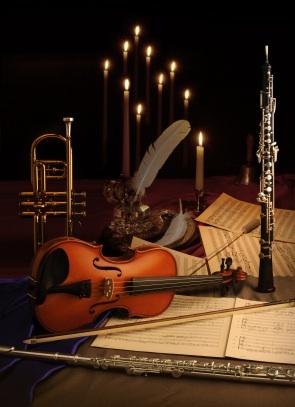 Violins, trumpets, and oboes – oh my! I am an oboist. I play guitar and sing everyday in music therapy, and I play piano frequently in music therapy and for my own enjoyment, but my major instrument, the voice of my musical self, is the oboe. For this reason, I find the oboe to be a great tool in music therapy. To graduate from a music therapy program and be board-certified, music therapists must have functional skills on guitar, piano, voice and percussion. These tend to be the most frequently used instruments in music therapy for their versatility in playing a wide-ranging repertoire for a wide range of interventions, but this does not discount the value of other instruments in particular therapeutic contexts. For one, music therapists may have the most technical skill and developed musicality on their primary instrument, which gives them more versatility for music-making. In my case, I am most comfortable improvising melodies in various modes and styles on the oboe because of the years I’ve spent playing scales. (Who knew how useful that would be?) In fact, the oboe was my gateway to becoming more comfortable with improvisation on all of my other instruments. Part of the value of orchestral instruments also lies in the unique sound they bring to the usual music in a music therapy session. For one, music therapists can use their orchestral instruments to play orchestral music, which can appeal to clients who prefer classical music. I have played orchestral excerpts and oboe solos with hospice and older adult clients to great success, even with clients who prefer or played other orchestral instruments. Each instrument’s unique characteristics also make it useful for different situations. The oboe has a piercing tone quality that can carry over the music of an entire group of percussion players. I have used the oboe to lead drum circles for this reason. The range of the oboe also aligns nicely with the human vocal range, and the tone quality is similar to that of the human voice, so the oboe can precede or accompany singing. Other orchestral instruments are valuable in other ways. Some instruments, like the cello or the tuba, grab clients’ attention by their sheer physical presence. Other instruments, like the flute and the clarinet, allow the music therapist to move around the room and interact with clients while they play. Still other instruments, like the violin/fiddle or saxophone, suggest particular musical styles (i.e. bluegrass or jazz), which can inspire different types of music-making with clients. So, what special instruments do you see or use in your music therapy groups? Why do these work for your clients? I’d love to hear your ideas and experiences! I’m so glad you wrote this post, Rachelle. I think it enriches our clients’ lives to hear instruments other than the guitar and piano and drums. And I would imagine improvising and interacting with our clients using our authentic musical voice may lead to a deepening of the therapy relationship, which is a good thing. As I’m sure you already know, Juliette Alvin used the cello improvisationally all the time in her work as a music therapist. My main instrument is guitar (classical), and when we’ve had Community Music Groups (not so much music therapy), I’ve played classical guitar when I’ve had a cough and couldn’t sing. I got the impression that the groups appreciated it. Thanks for your comment, Roia! I agree that it does enrich our clients’ lives to hear a variety of instruments and styles (like classical guitar). I like you description of our “authentic musical voice,” too – I do feel that’s what I have on the oboe more than on other instruments. It blew my mind when I heard another therapist talk about using the clarinet in her work (which was Nordoff-Robbins-based) – it changed my practice for the better. Rachelle, another great topic! I have only had the good fortune to bear witness to non-proficiency instruments and every time I see it, I wish I could offer that. For people young and old, an orchestral instrument is so fascinating to see and hear. It really shifts things in sessions and sort of opens up new doors. I co-treated with another therapist who played clarinet and even though we only did it once, it was amazing how it drew the children in and the intensity it brought to the session improvising with piano. As a piano major, I haven’t even been able to really use my skills because I have mostly been stuck on a keyboard. I always say it’s like giving wind players a plastic recorder to play. But it has served me well, anyway. And by the way, I LOVE the oboe and I’m so happy to hear that you use it! Wonderful! Thanks, Erin! I do love playing the oboe in sessions. I understand the frustration of playing keyboard after classical training on a “real” piano. I wonder, though, how do you think your classical training on piano has impacted you as a music therapist, differently than someone without classical training on piano? I stumbled upon your website and am so glad to find another music therapist with their primary instrument as oboe! You have inspired me to use oboe more frequently in sessions. The one time I did use it the results were quite surprising. My client had a cochlear implant, and she would rarely sing along when a guitar/piano was accompanying her, but when I played the melody line on oboe, she would sing clearly and loudly! I sometimes use banjo in the session, as well. Many of my clients enjoy the sound of it. It is also tuned to an open G chord, so it is easy for them to strum along! I’m glad you stumbled upon my post! I am a senior in high school and I play oboe. I want to play the oboe in college but I also want to do music therapy. I am thrilled to know you can incorporate the oboe in music therapy. What did you major in when you were in college? I majored in music therapy! I have a bachelor of music in music therapy from the University of Evansville and a Master of Arts from Saint Mary-of-the-Woods College. I loved UE because I got to do all the oboe playing I wanted to do – orchestra, wind ensemble, quintet, full recital, etc. I even subbed in the Evansville Philharmonic Orchestra. And I still love playing oboe in music therapy! I majored in Euphonium performance in undergrad, and now I am a Music Therapy Equivalency student at the U of MN. I was excited to see your blog post about using the oboe in Music Therapy sessions. Do you know of anyone using brass instruments in their music therapy sessions? I’ve heard of a Music Therapist who used a trombone with Oral motor and respiratory exercises (OMREX) – a NMT intervention. I guess, in theory, one could use a brass instrument to help patients with respiratory complications (although typically I think they use the recorder or harmonica). I definitely think you can use euphonium in music therapy sessions. It just depends on the setting, the client’s needs and goals, etc. Offhand, if I played low brass, I’d be using it for drum circle facilitation and to play polka music during Oktoberfest. On the other hand, you might find less use for it at bedside in hospice or a hospital. I studied Euphonium performance in undergrad. Now I’m a Music Therapy Equivalency student at the U of MN. I think it’s great that you still use your oboe in your current MT practice. I’m wondering, have you heard of music therapists using low brass instruments in their music therapy sessions?